James Cameron’s Avatar, which stormed past The Dark Knight to swiftly become the highest-selling Blu-ray in the history of the format, is well on its way to another HD distinction: the most pirated. TorrentFreak is reporting that the ten-plus gigabyte HD version of Avatar was downloaded more than 200,000 times in its first four days of availability. Could the film’s lack of availability from leading renters Redbox and Netflix be contributing to its popularity with pirates, Insiders? Or does it just stand to reason that the most successful film of all time would also be among the most illegally downloaded? Weigh in with your opinions in the comments (assuming you still have the bandwidth while your torrent finishes downloading). not surprised, since Redbox does not have it, people would rather pirate it. Maybe Redbox shouldn’t have entered into agreements that delay the delivery of movies to consumers. Apparently Hollywood hasn’t learned a damn thing about the internet in all these years. Staggered release dates in the internet age causes piracy. Simple as that. It’s almost a stab in the heart to have something available in one physical location, but not in your own. A completely unjust, unwarranted, and totally arbitrary limitation to serve only one perceivable purpose: to punish you for living where you do. These region-specific release dates are the single most idiotic thing the industry could ever do – more idiotic than suing customers (some may say they deserved it), more idiotic than fighting Redbox (some may say they devalue DVDs). It’s senselessly preventing people from spending their own money to purchase a product that’s available elsewhere. And it makes people RAGE. And when people RAGE, they stick it to the company. They download it for free. Microsoft did it right with Windows 7. One single global release date. No staggered bullcrap, no regional date. Everyone gets it on that one day they want it. Not one whole day for people in the UK to be reading reviews of a product they don’t yet have, and having time to get upset about the lack of availability. Everyone woke up on October 22, 2009, and was able to go buy Windows 7 in a store somewhere. If they couldn’t, it was because everyone else got there first. Not because the company decided not to sell it in their area. The Netflix/Redbox limitation is a similar, totally arbitrary limitation which serves only to limit availability and induce piracy. For some reason, Blockbuster still offers Avatar as available to rent, yet two other companies, both in exactly the same business as Blockbuster, aren’t able to carry it. And that too makes people RAGE, although it’s less clear to them why Redbox/Netflix don’t stock the movie. It’s pretty easy to see when the studio or company themselves are limiting distribution to a region, but when different companies have a discrepancy in their stock of a certain movie, the eyes turn to the companies: “Why isn’t Redbox getting Avatar?” – not “Why are the studios keeping Redbox from getting Avatar?”. That, then, gives the studios a nice buffer against the rage of the people. And people will still turn to the torrents because of it. With pirates being on the sea and all, I guess they couldn’t make it to a 3-D theater. I bit the bullet and rented it at blockbuster on Blu Ray and wacthed it with my family, came out to $1.00 each. Not bad especially since I missed out seeing it in theaters and it turned out to be an awesome movie. Had a hard time getting it to play and once it finaly did after unplugiing pluging in player it would pop up the chapter title picture and name at every scene change. Very disappointed in blu ray format compatibility, firmware updates. Would much rather have rented it in bluray at redbox but they don’t carry bluray around here plus the 30 day delay. But I have seen it all over the net for people to dl, more than any other movie I’ve seen and not just in Bluray format. People want to watch the dvd when it comes out on dvd not wait a month so they download it. 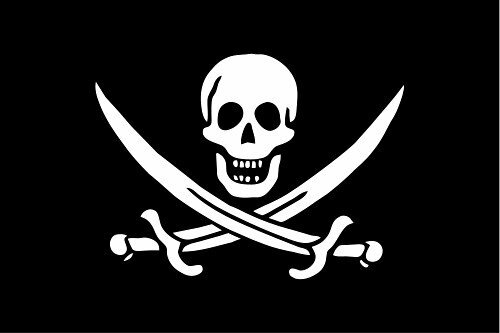 If they can’t slow the pirating they will loose out big time on rental fees from people not willing to wait the 30 days. This is the perfect movie for piracy … the release is practically set up to make piracy the best option. First they are releasing a “movie only” version … $16 for the DVD and anyone who likes the movie will be paying $30+ for the special version later this year. This abuse of the people who are fans of the movie is corporate greed. Theft is a natural response to corporate greed. Second, backroom deals with Netflix and now Redbox are delaying rentals to allow more profit from being made from sales. It isn’t available because the rental companies have decided not to make it available in collusion with the releasing company. Third, pirate viewers are used to lower quality copies. No credits? No problem. Visit the pirate world and you’ll find camera transfer movies where someone has videoed a movie screen … and they still get downloads. Better quality rips get more downloads. For $16 you can get “just the movie” in the store … for $0 you can get “just the movie” online. Only a person’s personal moral choices will stop them from saving $16 (or rationalizing it by saying they will buy the full version when it becomes available). The best fight against piracy is availability. Put the movie on Redbox on the DVD release date and make $1 per day per disc until the copy wears out. Put the movie on Pay Per View on satellite/cable and see how many people buy it for $6.99 like they did Sherlock Holmes. Give people cheap legal options. Otherwise it is just entrapment … setting people up where theft is the best way to get the content. Moral or not, legal or not, if companies don’t provide their products under reasonable terms people will find another way. You think $16 is too much to pay for a quality movie? It doesn’t sound like you would be happy with anything unless the studios were paying you to watch it. avatar could be copied for about $3 a disk once available from netflix blu-ray! already have a dvd copy on hd for free. havent watched it yet so cant tell you if it is worth $3 … definitely not more than 3! I agree with many of the comments here – lack of availability to legally rent (at a reasonable price – and $5.00 is NOT reasonable), is causing much of this piracy. The studios have brought this on themselves. I also agree that most people probably don’t realize that redbox was practically forced into the delay windows. Idea: Redbox should print the studios phone number and tell people to call and complain because of lack of availability. The movie studios think most people have to have it now, albeit an inferior version so they can trick people into buying the better version later, and then a third time in 3D next year. Maybe the ‘pirates’ really do have to have the inferior version now–for free–and will buy the good version later after the studios have finished jerking people around. I decided that I never have time to watch the extras anyway so I went ahead and bought the inferior version. Note to the studios: I will not be buying it 2 more times. I am waiting until November to purchase it. Had son return his Blue-ray because it was just a movie, he did not know. He was VERY disappointed since Blue-ray to him meant the extras were there. The people who really want to see the movie as soon as possible will just download a pirated version. Bonus – it’s free! It is true that in hard times people turn to entertainment but why consciously encourage that. Greed will be met with harsh disappointment. Hi, also love the Toy Story movies, great animation!